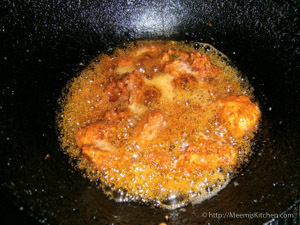 Thattukada Style Chicken Fry or Kozhi fry is a very popular street food fare in Kerala. 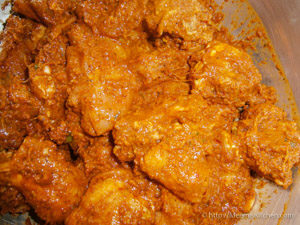 Chicken pieces are marinated in a spicy mix in advance and deep fried with curry leaves and green chilli. Thattukada are small shops, mainly covered push cart or vans that serve fast food/ street food. Thattukada usually serves tea, coffee, Thattu dosas, Ethakka Appam, Samosas, Uzhunnu Vada, Parippu Vada, etc and the most coveted items like Masala Omlette, Chicken Momos, Chicken Kathi rolls, Parotta and Beef curry, Parotta and chicken fry, Chicken 65 etc. You can find it in all the main streets of Kerala, near Bus stops or major junctions where you can always see a crowd gathering to relish the delicacies. It is usually open from evening till midnight or till the food gets over; the aroma is the main attraction of these food joints.During my childhood, I was often attracted by these shops; the aroma was so irresistible but my mother never allowed as she was always apprehensive about the hygienic factor of these shops. In those times, ladies never ate near these shops, it was mostly a male dominated area. Instead, we would relish the Parotta and Chicken fry parcels bought from these shops. Now a days, the story is different. Thattukada has improved in every way and some shops even provide seating arrangements. The menu is more elaborate and you get fried rice, noodles, Chilli chicken, Chappathis, Dal Fry, chicken 65, Katti rolls, Paratha Rolls etc. Hygiene factor and the quality of ingredients are still a concern though. This recipe for Thattukada Style Chicken Fry calls for whole red chillies, crushed ginger and garlic along with other spices and coconut oil for the exact taste and aroma. For best results, marinate for 4 to 6 hours before deep frying. Kids love this Thattukada Style Chicken Fry and finish off every bit of the crumbs. You can have it as starters or serve it with Parotta, Rotis, Naan, Pulao or Rice. Recreate this Thattukada Style Chicken Fry at home and see it disappear within no time. Green Cardamom : 4 nos. Green Chili : 5- 6 nos. Clean and cut the chicken into small pieces. Crush the Ginger and Garlic coarsely. 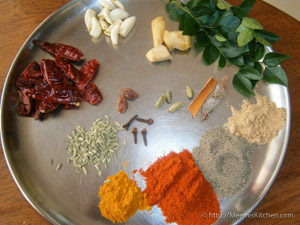 Grind the whole red chilies, Coriander, Turmeric, Pepper and Chili powders with Cinnamon, Cloves, Cardamom (peeled), Star Anise, Fennel seeds and curry leaves. 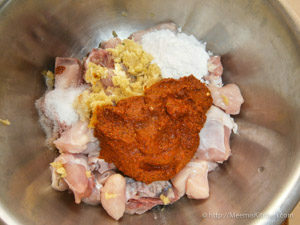 Combine the Ginger garlic mix, Spice mix, Rice powder and chicken. Add lime juice and salt. Marinate the chicken pieces, cover and refrigerate for 4 to 6 hours. Take out the Chicken pieces from the fridge half an hour before frying. Heat oil and fry the curry leaves and green chilies. Drain and keep aside. Fry the chicken pieces on medium flame to a dark brown turning in between. Drain and garnish with the fried curry leaves, green chili. Sprinkle with lime and serve with Parotta, Naan or Rotis. Enjoy! You may add red food color to make it more appealing and colorful. However, if your kids are allergic to colors, you may avoid it. For best results, marinate Chicken pieces for about 6 hours or more. You may also use chicken legs / Drum sticks. Make deep slits before marinating. To get the authentic taste, coarsely grind the ginger and garlic. Don’t use paste. Always use coconut oil for the special taste and aroma. You may add the rice powder just before frying if you want it more crispier. Don’t overcrowd the pan while frying. Always fry on medium heat and keep it on high while draining. 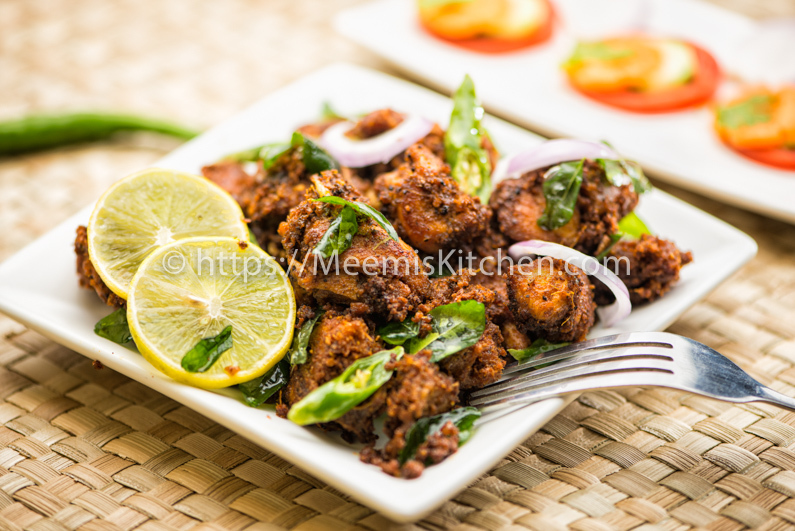 Enjoy this wonderful Thattukada Style Spicy Chicken Fry and let me know how you like it. Your feedback and suggestions mean a lot to me and would definitely encourage me to create more wonderful recipes for you. God Bless!! Yes Michelle, but you need to cover the chicken with a lid and cook/ fry on small flame till one side is done and turn and brown the other side. Alternately, you can cook the chicken with a quarter cup of water after marinating for 1 hour, then drain and dust with some corn flour /rice flour, and fry in a non-stick pan with little oil. Hope this helps.